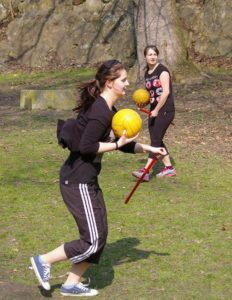 Muggle quidditch (to distinguish this real sport from the fantasy game in Harry Potter series) is a real sport mixing features from handball, dodgeball and rugby. In this sport, two teams play against each other. In each team, there are 7 players playing composed of 3 chasers, 2 beaters, a keeper and a seeker. There is a gender rule saying there can be a maximum of 4 people of the same gender playing in each team. In total, every team can have up to 21 players who can substitute continuously (the same as in an ice-hockey or handball). In the gameplay, there are 4 balls (a quaffle and 3 bludgers) and a snitch, which is entering the game at the 17th minute. Chasers (marked with a white headband) and keepers (green headband) play with the quafle and tries to throw or somehow carry it through one of the three hoops of different height on the opponents part of a pitch. Each goal brings 10 points to the scoring team. Moreover, keepers cannot be tackled or beaten by beaters in their own keeper zone and can put their arms through own hoops. Keepers also initiate every new attack after scoring. Beaters (black headband) play with bludgers trying to beat opponent players and protect own players from beeing beaten or attacked. There are 4 beaters in every game with only 3 bludgers, so the point is usually to maintain so called bludger control – having 2 bludgers in a team. In the 18th minute, seekers (yellow headband) enter the game trying to catch a snitch – small ball hidden in a yellow/gold sock attatched to snitch runner horts from behind. The snitch runner is kind of neutral player trying to guard the snitch against both seekers. By catching the snitch, the team obtains 30 points and the game is over (if the score is not same for both teams resulting in an overtime). During the gameplay all players must be „on broom“. Brooms are represented by plastic sticks of meterish length. When dismounting the broom or being hit by a bludger, the player needs to stop playing, run to touch one of own hoops, remount and then is able to continue playing. The balls are usually being thrown or carried, but can also be kicked once. In quidditch, specific physical contac is allowed, but is strictly limited by rules in order to prevent from injuries. Players can make a contact only with players of the same position (and chasers and keepers witch each other) in the area between shoulders and knees. More serious attacks can be made only to players carrying a ball, from the front part of opponent’s body and using one hand only. On tournaments, there are up to 4-8 referees watching the gameplay. 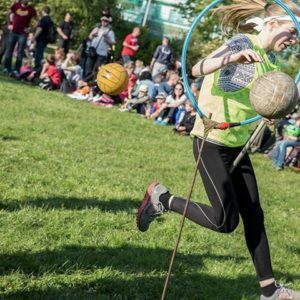 Quidditch is popular namely in english-speaking countries (UK, USA, Kanada, Australia), the Western and Northern Europe (France, Spain, Germany, Norway) and Turkey. There are also many teams in the Central Europe (Poland, Austria, Slovakia, Czechia, Slovinia) and South America. In Czechia, there are currently 3 official teams playing – Prague Pegasus, Occamy Olomouc a Brno Banshees. Also, teams in the cities of Liberec and Hodonín were trying to be established. The oldest is the Olomouc team formed in 2015 by student Markéta Štovíčková after coming back from Erasmus exchange internship in Trondheim, Norway (quidditch team NTNUI Rumpeldunk). You can read the basics of the gameplay on wikipedia. 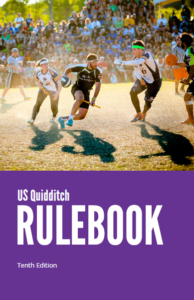 Complete rules can be found and read in the oficial english publication IQA Rulebook 2018–2020 at International Quidditch Association (IQA) website.